Nothing exciting has been happening lately in the area of exercise. I’ve been struggling a bit without a goal to keep my focus. Most days I’ve been walking and doing strength training in the gym. But I haven’t been out on the bike yet, as I’m a bit worried about the knee. The spin bike has been ok and so far has caused no knee problems so the outdoor bike will probably be fine now. Just have to get brave and do it. Keep putting it off in case it’s bad news that I’d rather not hear. 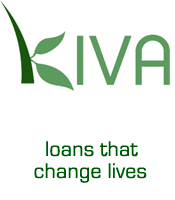 Finally I’ve decided on a goal. It’s the The Bloody Long Walk in Melbourne on Sunday 5 November. 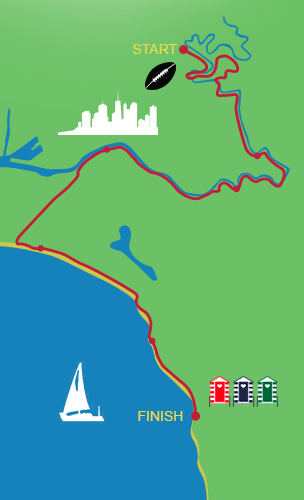 The walk is 35k, from Yarra Bend Park, Abbotsford to the St. Kilda sea baths. 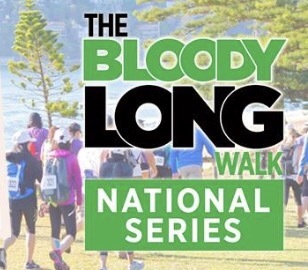 The Bloody Long Walk Training Program is on the website. Good to see that it’s nowhere near as intensive as the Coastrek Team Trekking Challenge training program. I am expecting this walk to be much easier than Coastrek, as it will be mostly flat with fewer stairs and not so much sand. Yay to that! However, it won’t be easy, so training must be done. The bloody long walk can be done alone or with a team. Teams can be any size, so I’d love to get some friends on board to do it with me.